Some of the worlds best trout fishing at your front door. The famous swirl pool on the Tongariro river, great for experts and beginners alike . Need some flys, see Lee next door he will do you a great deal. Twenty minutes drive to the Chateau Tongariro and the largest ski field in NZ ( Mt Ruapehu ) .Tramp the Tongariro crossing and experience NZs first World Heritage Park . Rental based on family of 4 (2 adults 2 children) $10 per night for each extra adult. Minimum 2 night booking, 3 night min for long weekends,4 night min for school holidays, a mandatory $85 cleaning fee applies . Smoking outside only please. Was a great location, close to the shops and not to far to travel for the snow. Was warm and cosy, and fitted 8 people well. Across the road from the nice big grass area. Nice place with great access to the river. We are very happy and enjoyed our stay at the place. Nice and cozy. Fireplace making the house nice and warm. Only thing we do wish there were heater or electric blanket for the room. 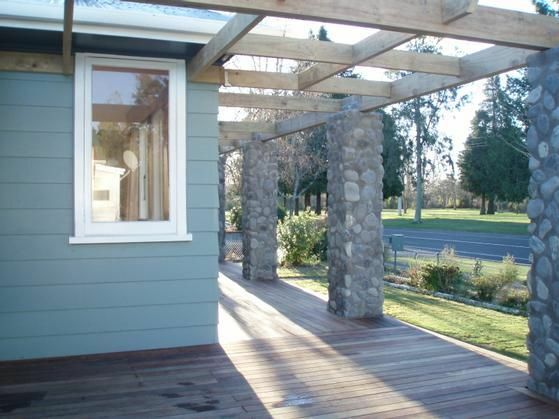 It was quiet cold in Turangi during winter. Just to keep the room warm before jumping to bed. But other than that we are so glad finding the place and will definitely recommend to other people. Best of all we still can bring our dog as well. Lovely, tidy, house. The fire was great for the cold winter nights.